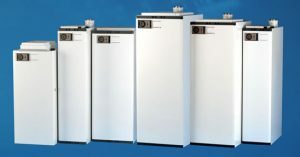 Warm Air Heating Specialists Airflow 2000 UK are warm air heating specialists based in Salisbury, Wiltshire. We supply and fit replacement warm air heaters and are expert in ducted warm air heating systems. As a leading nationwide supplier of domestic and commercial warm air heaters, we also supply grilles, registers, diffusers, galvanised ductwork and other components. Our range of installations cover multi-fuel appliances e.g. gas, oil or electricity. Airflow 2000 products are of British, American and European manufacture. Our services include: technical advice, surveys and all materials associated with warm air heating. We can undertake the complete project for you, utilising the expertise and skills of our experienced fitters, guaranteeing a high level of workmanship and finish. Our delivery service for grilles, ducting and spares covers all parts of the UK including the Channel Islands. Airflow 2000 have a range of manufacturer approved quality spare parts for your warm air heating system. Please contact us to find out more. Installation engineers available to service and repair your warm air heating system. Please contact us to arrange a visit. Replacement warm air heaters available to suit your heating system. Please contact us for more information. throughout the year. There are certain things that you need to consider before you get the right warm air system for your building. You also need to find the best installers to make the system work more efficiently to give maximum comfort. Airflow 2000 can help you with your warm air heating, grills and registers. We can recommend suitable products from popular manufacturers including Johnson and Starley, Janus, Bamford, Halstead. We can help explain the features and advantages, and help to configure the system for your own requirements.